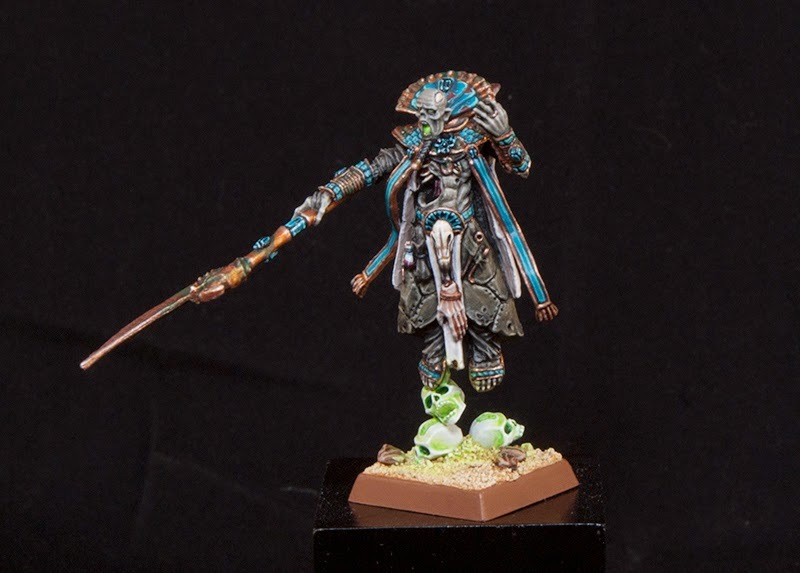 Hot off the heels of my King on Chariot I moved on to another character for my army, my Hierophant. I had said that I was going to paint easier models for awhile, but the allure of working on a character model was to much to ignore. 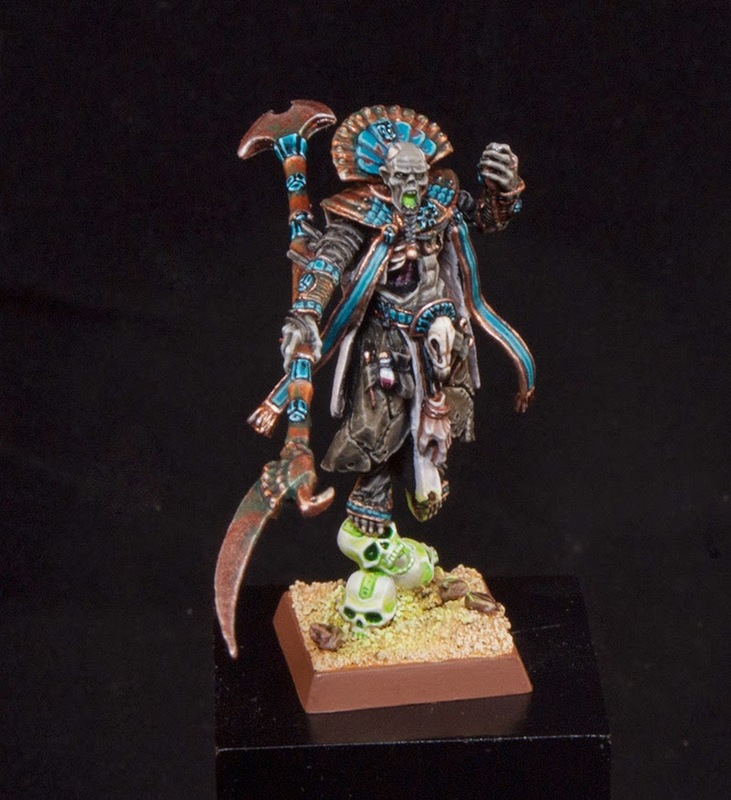 This guy was a lot of fun to both make and paint. You may not recognize the model, and that's because it's made up of a few different kits. 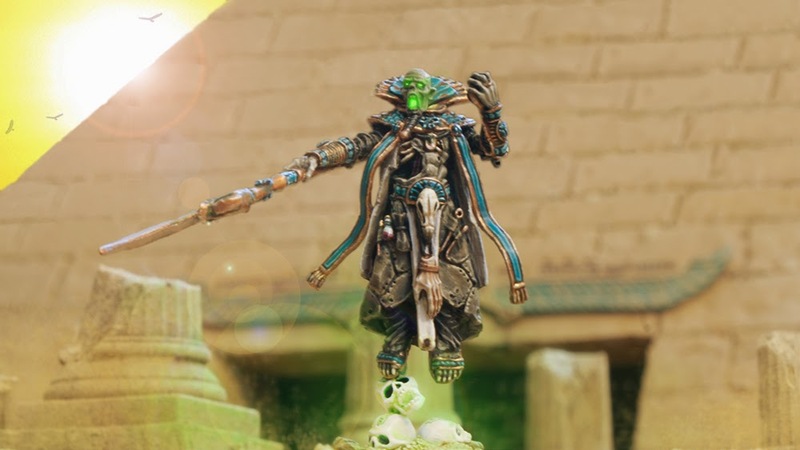 His body is from the Casket of Souls' priest, his arms from Settra, his head from the standard Liche Priest, and a few other random bits from the Tomb Guard kit and a good helping of green stuff. 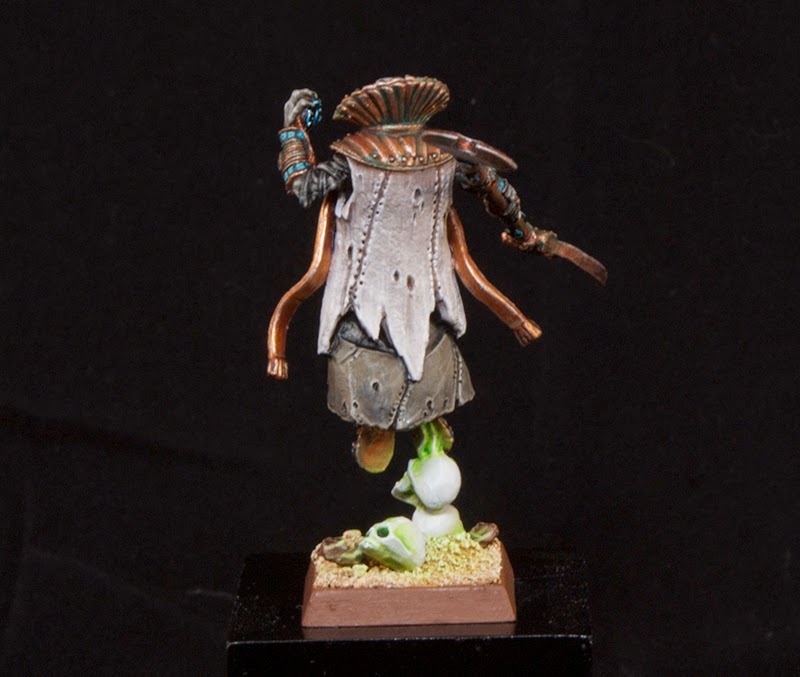 Like my Typhus conversion, this model would have been much harder to make if it wasn't in Finecast. The one thing I was determined to do going into the project was to make him float. Stealing in idea from my Casket of Souls I decided to go with some magical, ghost skulls keeping him afloat. Going into the painting portion of it I kind of winged it. 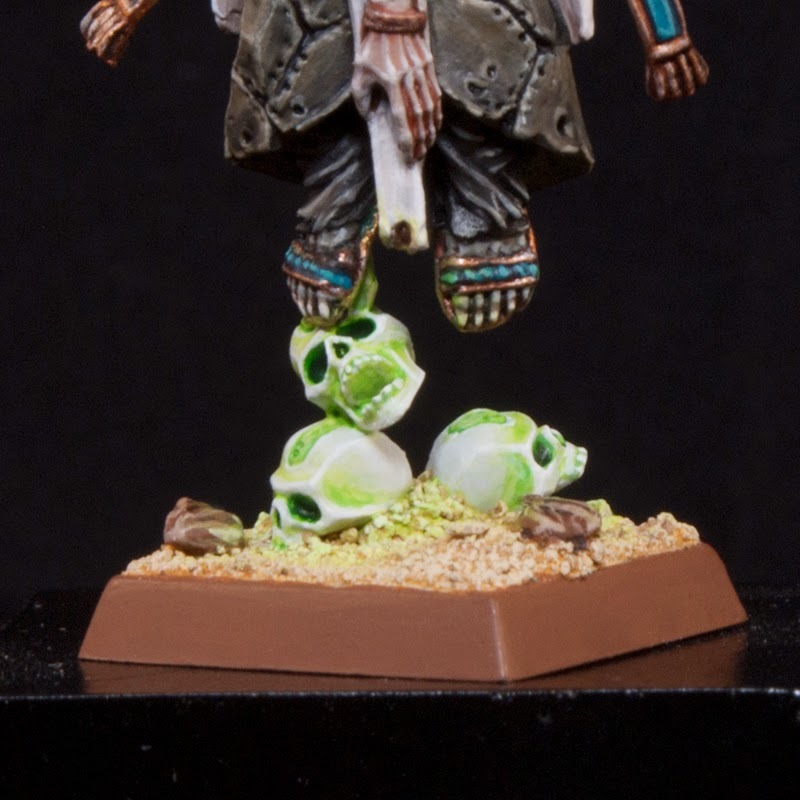 I'm not a huge fan of the stitched together, flayed skin clothes that some of the older Tomb King models have. 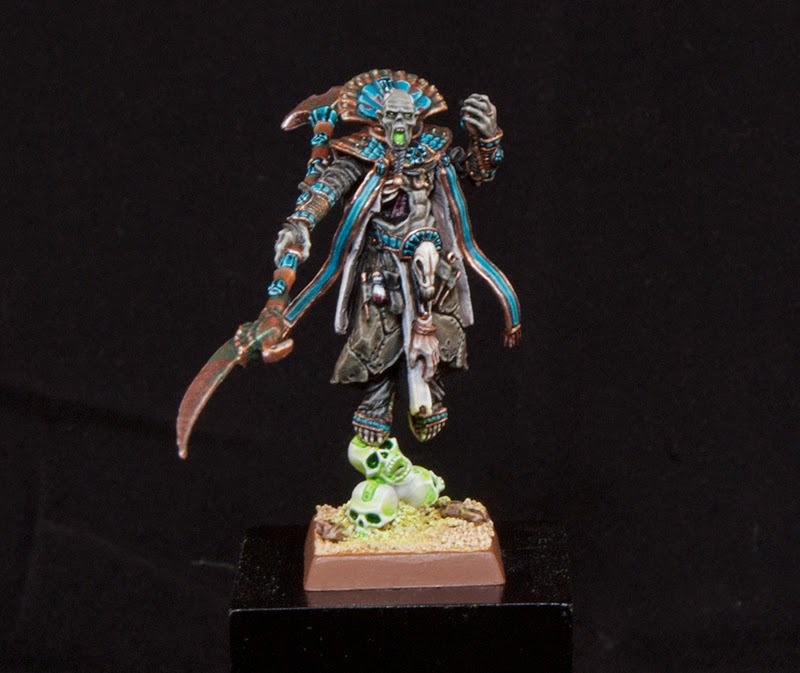 I knew I wanted to paint them to look more like leathers, plus I had already painted my Casket priest with a skin colored skirt. That was another challenge going into this, trying to differentiate him from my Casket model. Although he is heavily converted, the body is pretty much the same. I stole the colors for the skirt from my Tomb Prince. It's meant to either be a leather or maybe really old, aged flayed skin. 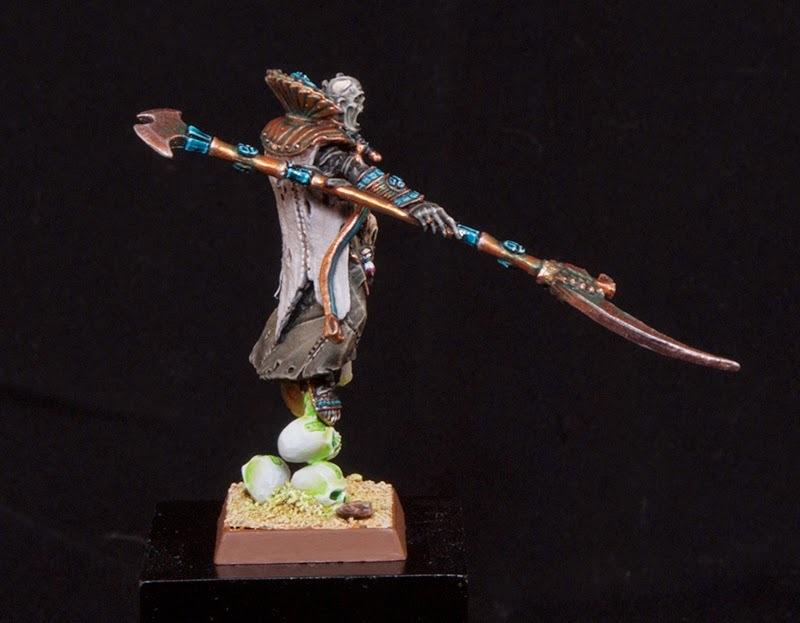 For his outer robe I went with an off white to tie him into my army color scheme. This left me with a bit of a dilemma for the skin though, as the skirt and my usual mummy skin color scheme were too similar. To try and separate the two more I added some grey into my skin mix. It made it lighter and drier looking and I really like how it turned out. The gold and brass were painted in my usual way. All of my other colors were also painted in my usual methods. It's always interesting trying to find the perfect balance of white, gold, and turquoise. The little knick knacks he has on his belt were pretty fun to paint. The severed hand is a perfect little detail to break up the front of the model and add some visual interest. I have also discovered that I really like painting vials of liquid. 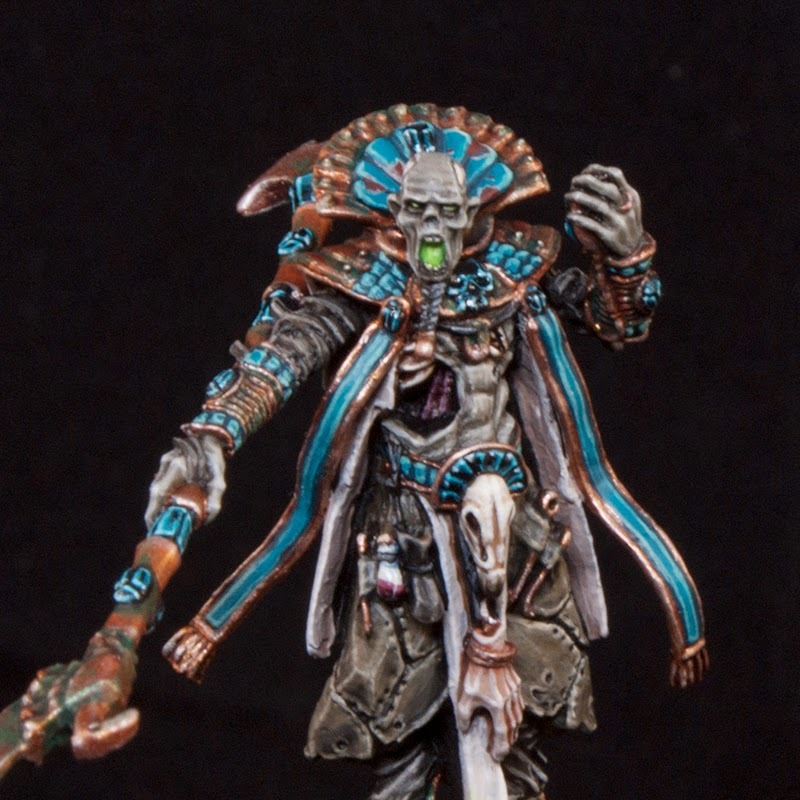 What's a magical Tomb King without some OSL glow coming from his eyes and mouth? Nothing, that's what. 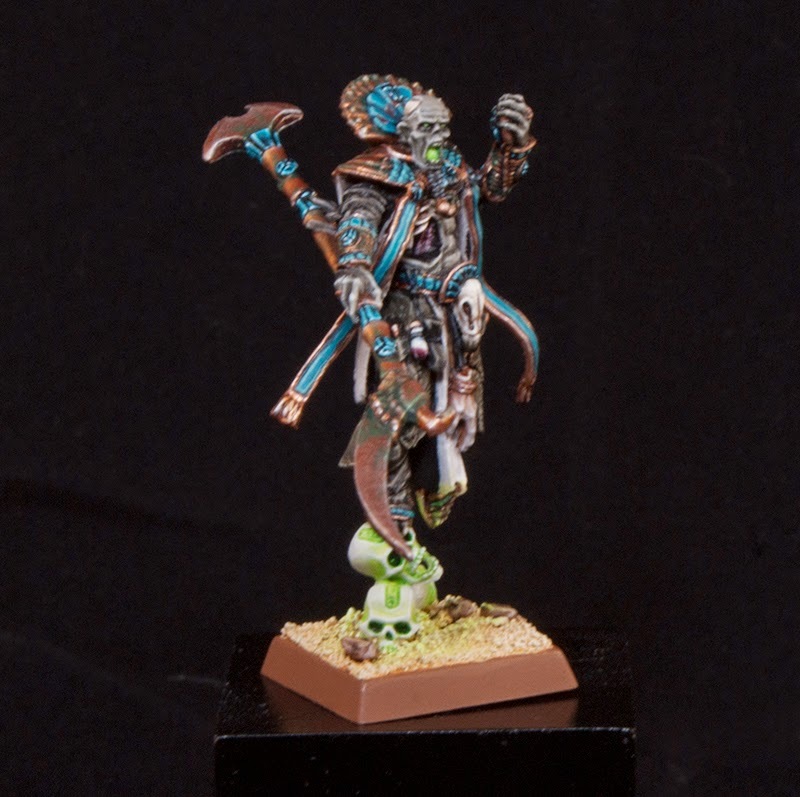 I painted this at the same time as his ghost skulls. These were painted with a basecoat of Ulthuan Grey and then washed with Scorpion Green (Moot Green). I deepened the green a bit in some areas with some Snot Green (Warpstone Glow) and washed the eyes and nose with Dark Angels Green (Caliban Green). After this I blended back up to Ulthuan Grey and then highlighted it with pure white. 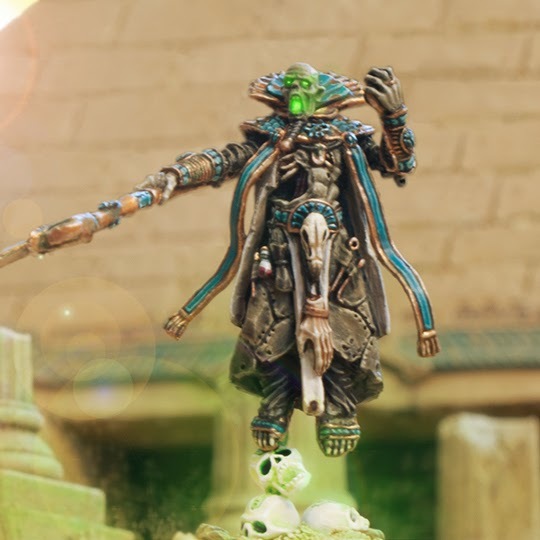 There was a lot of back and forth in this step, and I probably came back to touch up these skulls at least four times throughout the rest of the model. He was a lot of fun to paint, and he's definitely my second favorite model in my army at the moment. 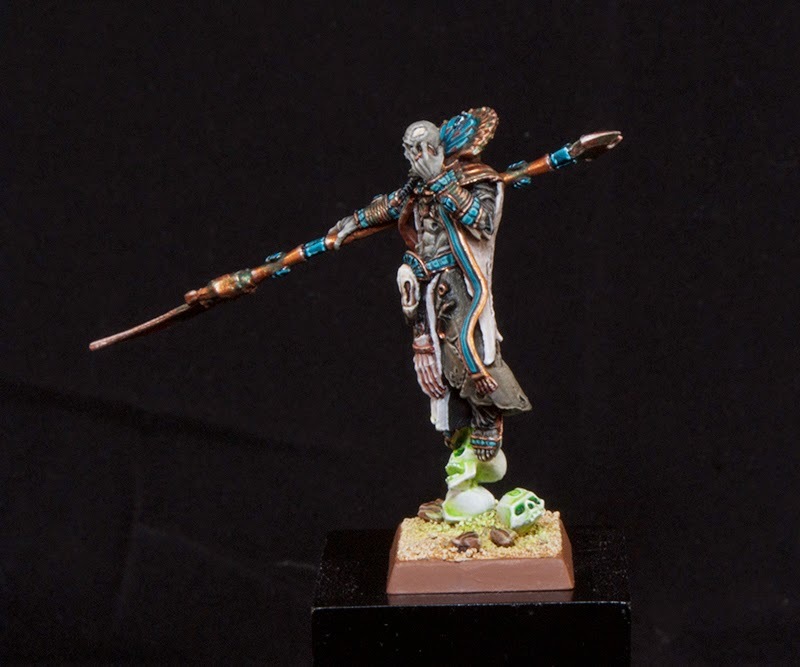 We Tomb King players don't have a lot of options for Liche Priest models, so I was determined to make my Hierophant (the high Liche Priest) as unique as I could. Last but not least, I can't forget about the video. The music is once again provided by Adam Harvey, you can follow him on his Facebook page and listen to some more of his music on his Youtube channel. Enjoy!